It was all going so well for the George Bell Group and the less well-known Bell Society. The Carlile Report had delivered a blow every bit as devastating as they (and I) predicted. A number of searching questions had been tabled to call the Church of England to account at the upcoming General Synod, and my Synod colleague David Lamming had crafted a typically measured and accurate motion to be offered for debate if it could garner the requisite 100 signatures to qualify for consideration in July. The Bell Group was co-ordinating a series of letters from a number of distinguished people calling on the church to uphold the simple twin propositions that ‘a man is innocent until proven guilty’, and that unless proven guilty by a fair process, a person’s reputation is entitled to be restored. Theologians and historians had already weighed in; distinguished lawyers were waiting in the wings and questions were being asked in the House of Lords. Richard Symonds took the bull by the horns and arranged a conference at Church House under the aegis of the Bell Society. Church House is home to the General Synod: it was a tank parked on the lawn of the Established Church, and undoubtedly provocative. The Bell Group and the much smaller Bell Society are like the Common Law and the Law of Equity: they run in the same channel but they do not mix. The Archbishop of Canterbury had issued a rather bullish statement reiterating that the late Bishop George Bell remained under “a significant cloud”. This was itself a provocation; ignoring the traditional ‘innocent until proven guilty’ principle, and with more than a nod to the intellectually bankrupt and legally discredited PC-driven narrative that “the victim must be believed”. He implicitly fished that notion out of the bin to which Lord Carlile had consigned it. It is like one of those zombie films: just as you turn your back, it begins to climb out of the grave. From Archbishop Justin’s “significant cloud” one reasonably derives that “he might be guilty”, which could be considered a fair judgment were it not for one very important omission. When has the Archbishop or anyone at Lambeth Palace or Church House ever flipped that coin over and publicly acknowledged the equal truth that Bishop George Bell might be innocent? For the avoidance of doubt, I have always shared the view of Baroness Butler-Sloss, that in cases of such historicity one simply cannot know. Yet I will not turn my back on the ‘innocent until proven guilty’ foundation. If an institution is to avoid being shaped by any individual’s subjectivity in these quasi-judicial matters, it needs a jurisprudence. The classic formulation ‘innocent until proven’ seems to me the least worse on offer. I do not believe that the Church of England has, or is equipped to develop, an alternative approach. It has certainly never attempted to do so. When the late Bishop of Gloucester Michael Perham fell under two allegations of sexual assault (one against a minor) and retired after being cleared by proper process, Archbishop Justin led the standing ovation. So he should – absolutely, absolutely – but have we ever been assured that both of those accusers have since withdrawn their allegations? If not, I cannot see the differentiating principles at work. Two Bishops; two allegations apiece; neither found culpable by proper process; both entitled to their former reputation – except George Bell. As my priority is good process, I was less troubled to hear this than those admirers heavily invested in George Bell’s saintliness. Not one of them, however, ever expressed the thought that the church has any alternative but to investigate thoroughly. Where they diverged was that they accepted all of Lord Carlile’s report, whereas the church rejected the idea that the accused deserves anonymity in the early stages of an accusation. The church asserts its belief in the primacy of transparency, yet, as currently practised, it a very odd form of transparency; more ‘now you see it, now you don’t’. Few argue that a victim should enjoy anonymity. Everyone accepts that nothing should be disclosed that compromises a proper investigation, yet as the Carlile Report demonstrates perfectly, virtually everything else can be safely put into the public domain, including the character of the allegations in explicit detail. So far, the church has only put the fact of “fresh information” against George Bell into the public domain. No information has been forthcoming as to when this was first known, leading to a febrile atmosphere and the inevitable unhelpful accusations of ‘game playing’. General Synod can and should press for answers about the deficiencies of the original process. None of Carlile’s critique is invalidated, even if the church has discovered a confession signed in Bishop Bell’s own blood. Further, it should insist upon substantial transparency in all matters of process in relation to the latest information. That is almost certainly less problematic than may be thought. We probably know a lot about it already. We have been told that is that it concerns a woman in her 70s, raising instantly the same problem identified by Professor Maden in the original inquiry: “The only way to establish that the allegations are true would be through corroborating evidence” (Carlile Report para. 178). Put bluntly, if there is no corroboration, the church does not need to struggle officiously to keep the allegation alive. Those charged with the task need to exercise a degree of backbone and not prolong the agony. We can go a stage further. The church can and should clarify forthwith whether this allegation is actually already in the public domain. This may surprise a few. Let me explain. Whilst His Grace was pondering the Archbishop’s apparent confidence, one of the church’s abuse victims contacted me. They may not all share my depth of interest in the Bell case, but they view me as an advocate for them at Synod, which still manifests a degree of indifference toward them when they accuse the modern church of failings. The victim community talks, hears, and knows a great deal of confidential material, and they wish me well. I was warned of a fresh revelation about Bell before the church’s latest “fresh information” press release. Talking to my source, who had accurately predicted the church’s announcement, I volunteered my theory that the new matter fitted that old accusation. I do not press victim informants to breach confidences or to disclose matters which may be sub-judice, so was flattered and pleased that he did feel able to respond that I was “red hot”. My best working premise is accordingly that this “fresh information” is actually old information, though that is not to say it might have been amplified and/or filled out somewhat. If I am right in this assessment, it would have a number of implications and fair questions. Precisely when did the Church of England (or the Archbishop of Canterbury) first hear of the allegations? Who was notified and in what circumstances? Did the church take any notice of this Chichester Post report in 2016? If so, what did it do? If not, why not? Why was it that such an important story was not taken up and investigated by any major newspaper? When the Chichester Post journalist Sian Hewitt went on to write for the Daily Mirror, why was this story not pursued through that national newspaper if the complainant was so credible? This was potentially a very big story, was it not? Did the police investigate it then? If not, why are they investigating Bell now? Most importantly, if the complainant was serious and had spoken over 18 months ago, why did she not make her allegations known to Lord Carlile when he was known by her to be independently investigating? Incidentally, whoever raised this matter now has significantly prejudiced justice being done because of the delay. We no longer have the late Canon Adrian Carey to ask; he was the last surviving witness from the Bell household but has since died. The delay has had an important deleterious consequence to the defence of George Bell. Any allegations can no longer be checked with him. That is a significant and serious prejudice to the accused deceased as a direct consequence of the complainant’s chosen delay. 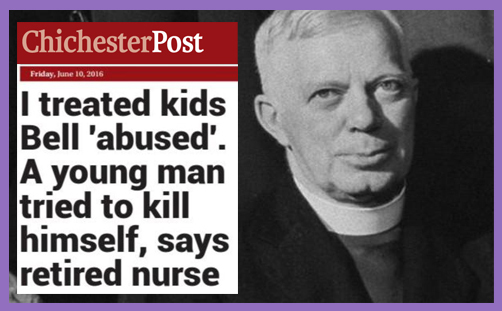 Shortly afterwards, a journalist claimed in a local newspaper article that she had had contact with an unnamed mental health nurse who had treated ‘numerous boys and girls’ in hospital, whom she said had been abused by Bishop Bell. I made considerable efforts to contact the journalist and test the substance of these allegations, but was unable to make contact. I left messages to which there was no response. During the months of my review, nobody has come forward to support the story. Given the circumstances, including the lack of any identification of those mentioned, and the possibility of confusion with others (including Bishop Peter Ball, who is mentioned in several places below), I have concluded that the story cannot be substantiated and I have therefore ignored it. This inquiry concerns one alleged victim who describes a 4 year course of action. Despite widespread publicity there has been no other alleged victims coming forward. That may be significant. 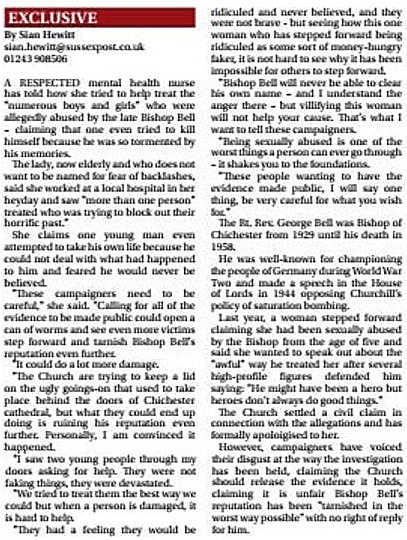 I should however briefly reference a single story published in a free sheet local newspaper which alleged that an elderly psychiatric nurse had said that she had “treated” young boys at the time who had allegedly been abused by Bishop Bell. She alleged the scandal was covered up. There has been no follow up investigation and no such boys have come forward. One does not know what may conceivably arise in the course of this review, given its openness to receive submissions. Suffice it to say that should a representation come from such a quarter it would raise the need for a separate and more wide ranging Inquiry. The implication of the allegation (advanced without corroboration) is not simply one of police or Church cover-up. Psychiatric nurses do not “treat” on their own behalf. They work under Psychiatric oversight making and preserving clinical notes. The alleged informant was implying a cover-up involving multiple members of the medical profession including the interviewee herself. If such a widespread conspiracy existed, its investigation would need to be of greater breadth than the current inquiry. This story, should it feature, must be investigated fully and separately or discounted; plainly it is not appropriate for anyone to pray it in aid as a “makeweight”. Paradoxically, I may have treated the allegation more seriously than anyone else at the time. Proper process requires us to follow the evidence wherever it leads. So, we may have endured considerable turbulence based upon a hearsay delayed allegation which cannot be corroborated and which no authority took seriously when it was first published. It could still be true, of course: one of the victims could come forward with credible testimony, but this is not what we are currently being told. If it changes, we start all over again. Meanwhile, victims of more contemporary and proven abuse will be standing outside General Synod asking us to support their quest for justice with just a fraction of the time we are currently expending arguing about events of 60 years ago. The sooner we get all this out into the open and settled, the faster we can turn our attention to their long neglected current needs. To do that quickly we need real transparency, and the sooner the better.